Storms often have an adverse effect on trees, which typically requires inspection and care by qualified arborists, and in some extreme cases, it may also call for tree removal services. When you’re looking for storm damage, check for cracks in trunk and major limbs, and broken or partially dangling branches in the crown. The most significant aspect of caring for your trees is to heed caution. Since a damaged tree can be unstable, you must be very careful while inspecting it. Ascertain If You Require Tree Removal Services – Storms often cause extensive damage to trees such as exposing their roots, breaking off limbs, and taking off a significant portion of the crown. In these cases, it is not wise to treat them yourself. Instead, you should use professional tree removal services to treat trees which are damaged beyond repair. Using Tree Pruning Services – Heavy rains accompanied by strong wind can damage tender plants, wash away mulch, break tree limbs, and erode the soil holding the roots. If it’s safe, you should remove the damaged and dead parts of the trees to help them recover and heal quickly. Additionally, you can make clean pruning cuts to help close the wounds. If you are not equipped with the knowledge or tools to treat the trees, it is advisable to use professional tree pruning services to get the job done. Don’t Be in A Rush to Treat Less Damaged Parts of Trees – Once you remove the severely damaged parts of the tree, you must be patient and let the tree heal itself. Don’t rush into cutting off the uneven branches. Instead, wait till you see sprouts growing and let the trees recover what was lost, and then prune them for better appearance. Wait Before Fertilizing Them – Although your intentions may be good, think if your actions will help the trees. Unless you feel that the trees are deficient and in dire need of specific nutrients like nitrogen, you should wait till the next season to fertilize them to avoid the fertilizers getting washed away due to the rains. Watch Out For ‘Door Knockers,’ & Hire A Qualified Arborist – You may often find people knocking doors and offering to help care for damaged trees. You don’t have a way of determining if these workers who go around with pickup trucks and equipment like chainsaws are genuinely insured or qualified. It is always recommended to use the services of a qualified arborist who is insured when you need to have work performed on your trees. Although storms can cause extreme damage to trees, you can potentially save them from permanent damage or removal by using the services of professional arborists. At DreamWorks Tree Services, we have an experienced team to assist you with all your tree care needs and provide you with the right solution at the best prices. 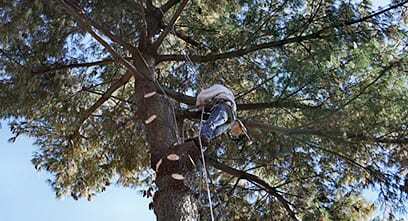 We also offer 24/7 emergency storm cleanup, tree cabling & bracing service, and tree pruning services. Call us today on 1-800-407-9917 to speak with our tree care professionals and schedule an appointment.